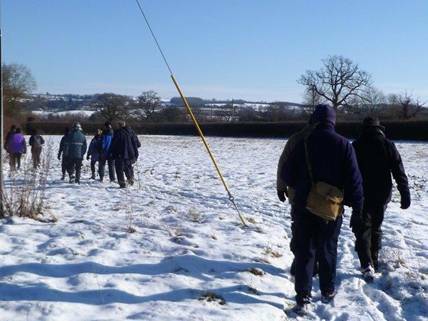 Thirteen walkers turned up at Bourton for the 89th Saturday Pub Walk. 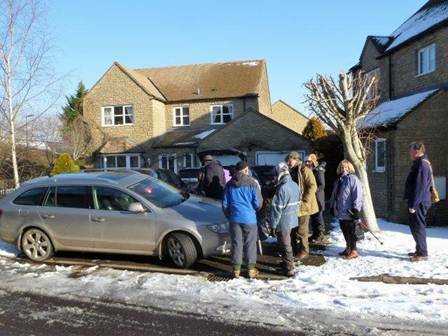 This the third walk at Bourton with two previously at the Mousetrap in 2010 and 2018. 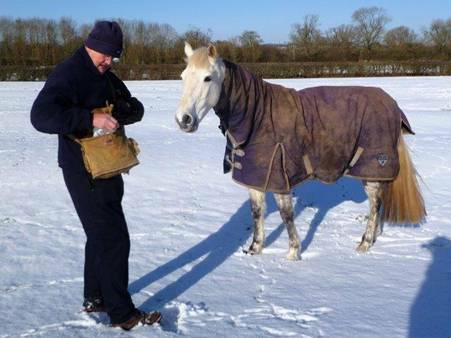 This time in bright sunshine after recent heavy snow. Meeting at Green Lake Close (Photo 1) to save parking fees before setting off left along Lansdowne before taking a right next to the Mill House. A delightful path alongside the River Windrush emerging at a road just up from the Old Manse (Photo 2). Lunch ordered we continued along the Windrush to the ford turning right then shortly left along a path behind Birdland. 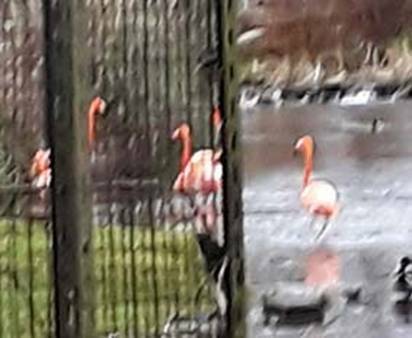 You may see Flamingos on your left (Photo 3) on reaching Birdland and other creatures as you progress along the path and even dinosaurs at the end. Through a gate then right through another gate onto a footpath across a yard heading south. 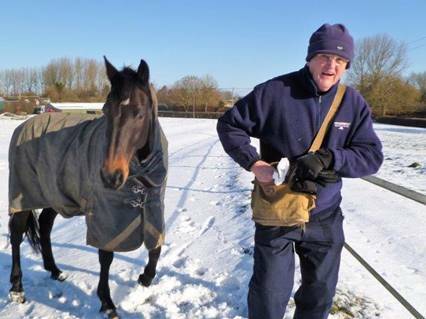 Across two fields greeted by very friendly horses chasing after Dave’s apples (Photos 4 and 5). Continue south on the footpath to Marsh Farm where sharp left to Marshmouth lane (Photo 6) then right to Lower Marsh Farm where right towards Clapton heading west. 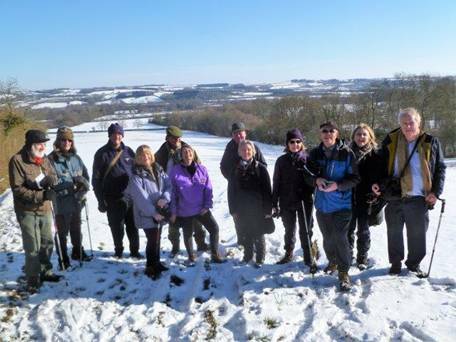 Through a few fields up hill with great views opening up and pausing for a group photo in the snow (Photo 7). Right at the top heading North West, then downhill to the north. Through sheltered new woodland then across another field and into a delightful avenue of Fir Trees (Photo 8). 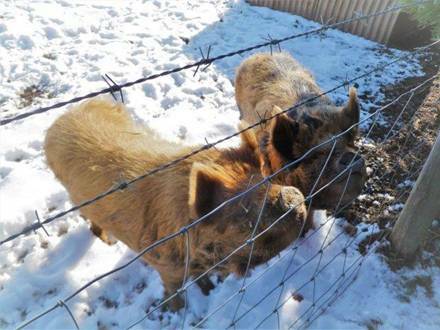 Do not miss the miniature friendly pigs on our right who finished the remaining apples (Photo 9). Then rejoining the path near Birdland and back to the pub for lunch. 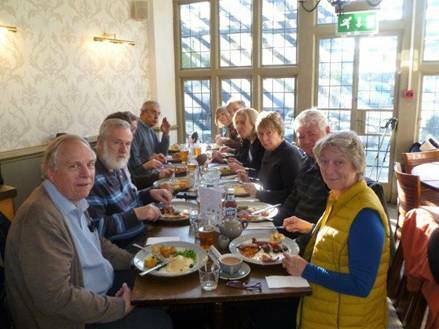 A great value lunch was enjoyed in the refurbished dining room (Photo 10)) washed down with a choice of Prescott Hill Climb or Green King IPA or Abbott. No prizes for guessing our universal choice. 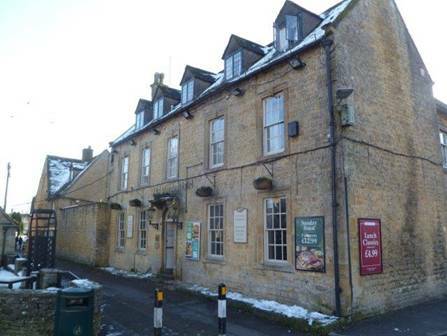 Fortunately the tenant is allowed one free pump which is always Prescott, an oasis in Bourton in a desert of Pubcos ( Mousetrap excepted). A great walk in this picturesque village on a totally different route to the previous two. 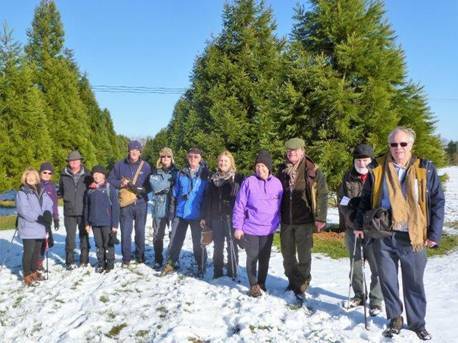 The next walk is the 90th from the Sherborne Arms, Northleach on Saturday 2nd March 2019. Free parking in the adjacent Square. This is an Enterprise Inn but has Butcombe, good value walkers food, and great walks.